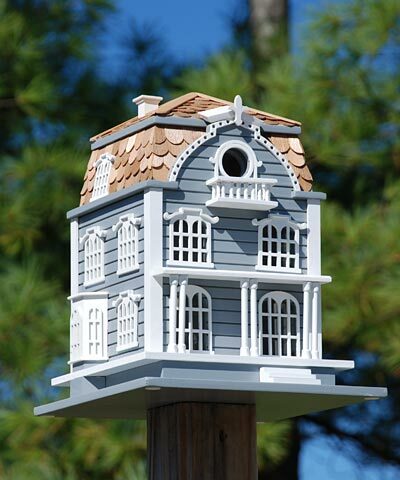 Offer your favorite songbirds a private mansion using the Home Bazaar Sag Harbor Bird House. The intricate details and contrasting colors create a remarkable home, beautiful enough to use indoors as a decoration or outdoors for the birds. The gray color of the home evokes the sea, with white accents reminiscent of waves. The crisp white paint on the ornate window frames, porch, balcony, and columns easily attracts attention, and scrolled detailing at the top of many windows enhances the piece. Faux bay windows on two sides of the home bring added depth and dimension to it, and the slightly elevated base forms a substantial roost. A mansard roof with cedar shingles tops the piece, bringing more color and texture to it. The 1.25" diameter entrance hole sits at the top of the house, leading to a deep cavity for your avian friends. This aids in keeping predators out of the nest. Clear plastic panels behind many of the windows allow you to monitor the roost without opening it and disturbing the fledglings. For more thorough checks, the back panel may be removed. A drainage hole in the center of the shelter helps nests stay dry, while the tall design keeps the temperature regulated. The wooden body forms a lasting structure, which can be easily displayed on a post or pedestal using a mounting bracket (not included). Add a dignified roost to your bird garden with this Sag Harbor Bird House.